The remaining 56 cards make up the offensive deck. 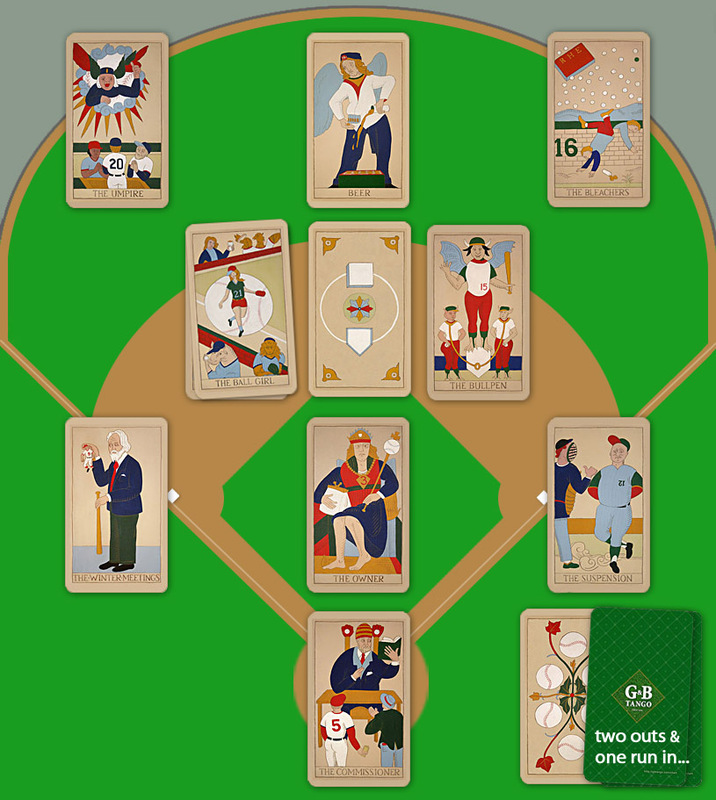 The offensive cards consist of 4 different suits (Bats, Balls, Gloves and Bases) with 13 cards in each suit (Ace-10, Rookie, Veteran, All-Star). 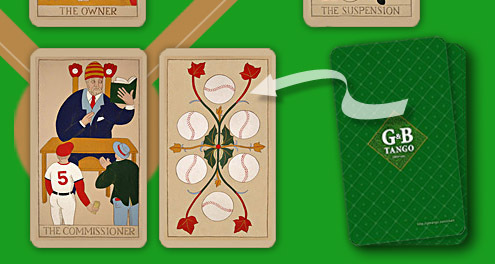 In addition, there are 4 special wildcards: The Whiff, The Beanball, The Pickoff and The Circus Catch. Once the cards have been divided into a Defensive and Offensive deck, each part should be briskly shuffled. Shuffling is an important aspect of this game, and should be done only when called for by the rules. To begin a game, each player must draw a card from the Defensive deck. The player drawing the card with a higher value will be the Home team, and his/her opponent is the Visiting team. The Home player takes the shuffled Offensive deck and deals it out face-down, giving a card to the Visitor and then to him/herself, alternately, until all 56 cards are distributed. At this point, there should be three different piles of cards: one 22 card pile for the Defense (which will be used by both teams) and two, separate 28 card piles. These latter two constitute the Offensive decks for each team for the duration of the game. At no time will the teams trade cards, and at no time may the players review the cards in their decks! This would eliminate the element of suspense from the game and greatly detract from the excitement. Imagine the defensive deck being laid out over a playing field. Turn over the first card and place it face-up at the pitcher's position. Then do the same for the catcher, the first baseman, and so on, until all nine defensive cards have taken the field. 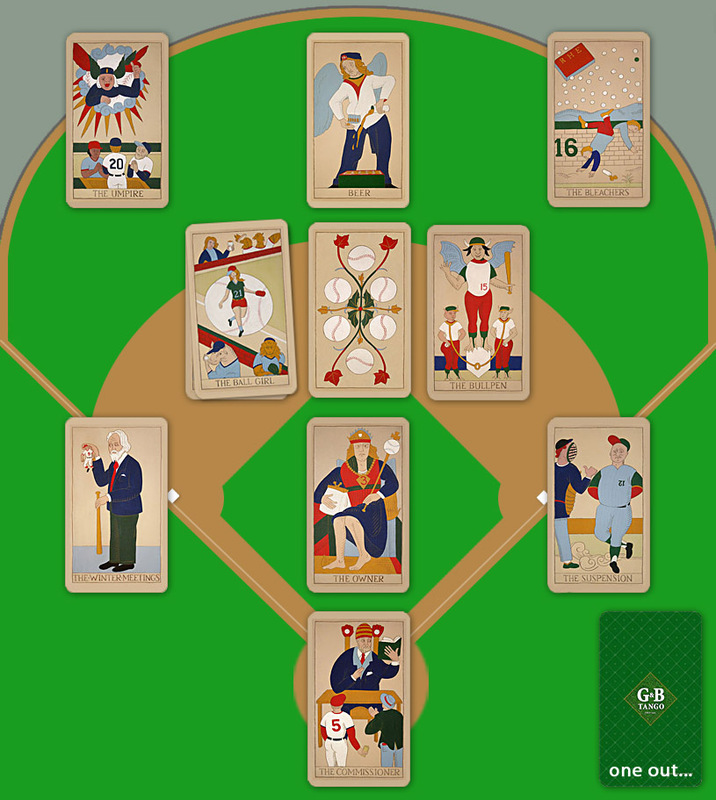 It is imperative that the cards be placed by the player in the field in the specific order described in the illustration above. Any deviation from this order would constitute a forfeit of the game. The view of the defensive alignment (above) for both players should be similar to that seen from two adjoining seats high behind home plate. 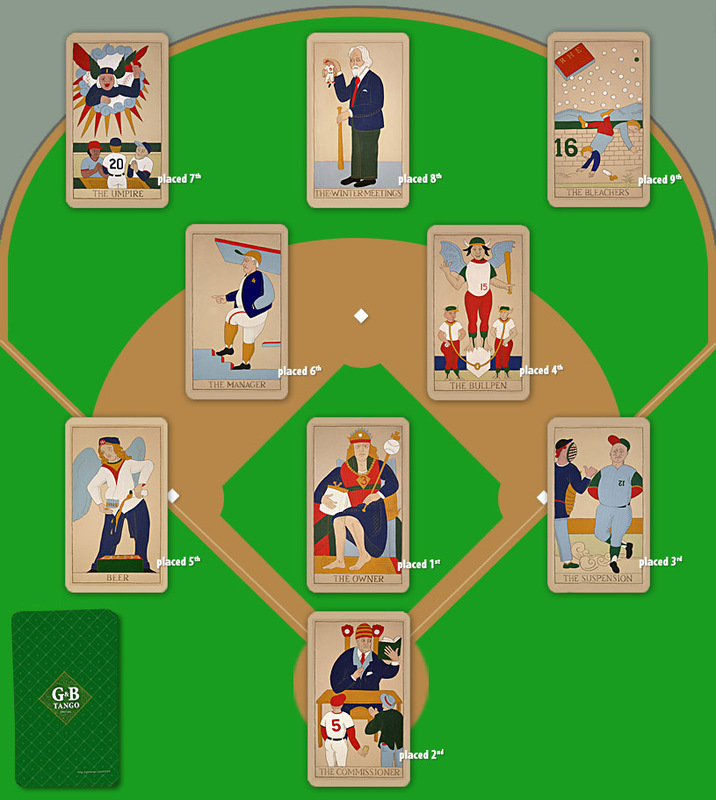 Once these 9 defensive cards are positioned, the remaining 13 should be placed face-down near the defensive team's side of the field (the dugout). These 13 cards should not be shuffled, as some of them may yet be used in the inning. Now the Visiting team comes to bat, taking his/her shuffled Offensive deck face-down and turning over the top card next to the catcher card. Every card that the batting player turns over will result in some kind of an at-bat; a hit or an out, with very few exceptions noted later. The Offensive Card Hitting Chart can be used as a guide to the result of each at-bat, but after a few games these results are easily memorized. Certain cards, when they come up as an at-bat, have unalterable results. 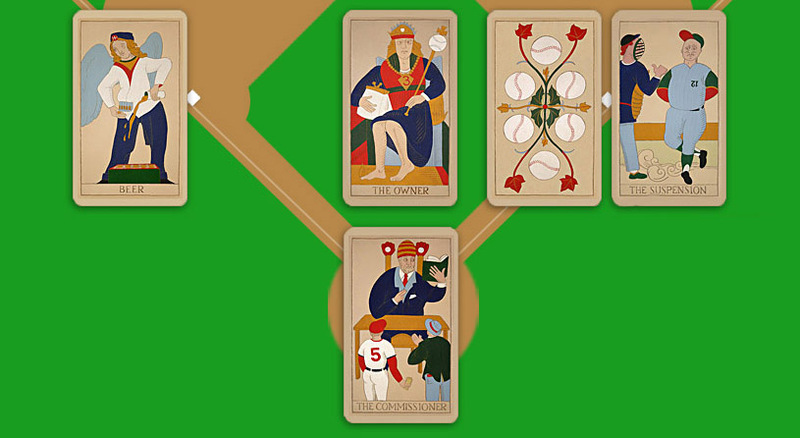 These are the Ace, Deuce, Three and Four of each suit, and the four special wildcards: The Whiff, The Beanball, The Pickoff and The Circus Catch. For instance, The Four of Bases always indicates a home run, while The Whiff always means a strikeout (with one exception, see The Fan as pitcher). The remaining cards in each Offensive deck may result in fabulous hits or cheap outs, depending on their strength and direction. Both of these qualities are derived from the numeric value of the drawn offensive card (5-10, Rookie = 11, Veteran = 12, All Star =13). As you read this section, notice that in this game, a tie goes to the fielder. If a 5 of any suit comes up as the card at-bat, this indicates a ball hit to the pitcher. It will result in a single if the defensive card at the pitcher's position has a value lower than 5. Similarly, a 6 means a ball hit to the catcher, a 7 goes to first base, an 8 to second, a 9 to third and a 10 to the shortstop. In each case, if the offensive card's value is greater than the value of the defensive card at that position, then the result is a base hit (see Base Cards about hits past the first or third baseman). If the offensive and defensive cards involved are of equal value, or the defensive card's value is higher than that of the offensive card, the result is an out (see The Fan with regard to this). A picture card (a Rookie, Veteran or All Star) of any suit indicates a ball hit to the outfield. A Rookie (value 11) means a ball hit to left field. If the defensive card in left has a value lower than 11, then the result is a single (see Base Cards/Rookie of Bases, however). If the defensive card's value is 11 or higher, then the result is a fly out. A Veteran (value 12) means a ball hit to center field. If the defensive card in center is lower than 12, then the result is a double (see Base Cards/Veteran of Bases).If the defensive card's value is 12 or higher, then the result is a fly out. An All Star (value 13) means a ball hit to right field. If the defensive card in right is lower than 13, then the result is a home run. (When the All Star of Bases is the card at bat in this situation, it's considered an inside-the-park home run, and the team at bat will probably choose to whoop it up a bit.) If the defensive card's value is 13 or higher, then the result is a fly out. We will now run through a sample half-inning of play to show how the offense and the defense work in different situations. Well-protected at the corners, but some weaknesses up the middle. The pitcher card's value of 3 won't stop a hit back through the box. The catcher, shortstop and the centerfielder are all also too weak to prevent hits. It's moderately porous. The offensive player turns over the top card of his/her shuffled offensive deck and places it next to the catcher. It is the Six of Balls. The Offensive Card Hitting Chart is now consulted and it is seen that a Six of any suit goes to the catcher. Since 6 is greater than 5, the result is a hit. If the catcher card had a value of 6 or higher, the result would have been an out. This was probably a bunt, or at least a weakly hit ball, since the catcher is doing the fielding. The Six of Balls, having squibbed a single, is moved to first base. At this point, an exclamation of delight may escape from the offensive team, and the defensive team may well mutter vile oaths. Game-long chatter is unavoidable, with much cheering and groaning to accompany certain events. Since a runner has reached base in this inning, a switch of any two cards in the field and one replacement from the 13 defensive cards in the dugout are allowed. This switching and subbing is done in an attempt to fix any weaknesses in the defense. As the rules become familiar, the strategies involved in strengthening the defense become better understood. Two defensive cards are switched in the field for better defense. 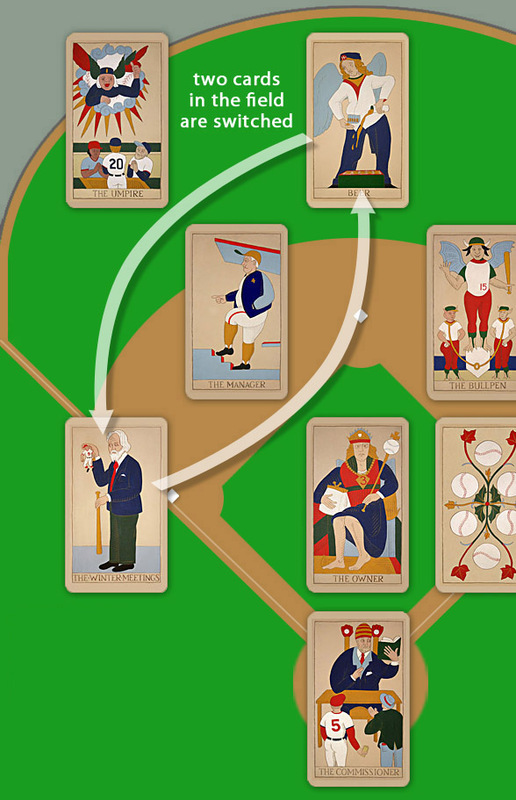 In our example, the #9 card (The Winter Meetings) is moved from centerfield to 3rd base, trading places with the #14 card (Beer). This protects the centerfield position against the possible appearance of a Veteran (value of 12) in the inning, while keeping the value of the third baseman high enough to prevent any hits there (a Nine of any suit means a ball hit to third, and a tie in value goes to the fielder). No further switches will be allowed this inning, but one substitution may still be made. To sub, the team in the field first declares which card in the field will be replaced. Then the top card from the 13 remaining defensive cards is taken from the dugout and turned over on top of the card to be replaced. The top card from the dugout is taken and turned over atop the card being replaced. 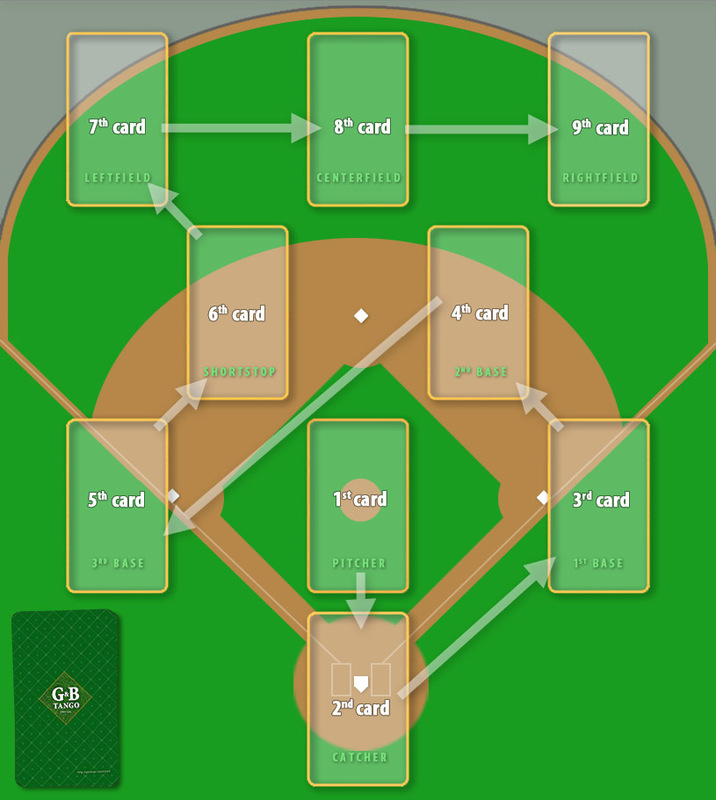 In the example, the team in the field subs for the #4 card (The Manager) at the shortstop position. The substitute turns out to be the #21 card (The Ball Girl), which would strengthen any postion (a Ten of any suit means a ball hit to short, and 21 is higher than 10). Once a substitution is declared, it must be made, even if a weaker card turns up as the sub. NEW! October, 2015 -- This is an alternative rule suggested to us at The National Baseball Hall of Fame by a young man named PJ (PJ -- if you're out there and would like to be fully identified, contact us and let us know! ): The value of the substitute card is added to the value of the card already at that position. In this example, there's no effect, since the Ball Girl card's value is already so high. Imagine instead that the World Series (the #8 card) came up as the substitution. The value of the shortstop position would have been 4+8, or 12, which would protect against any ball hit to short, whereas the 8 would not have offered any better protection than the 4. This is clearly an advantage for the defensive team. When you play, it should be agreed up front whether or not PJ's rule is in effect for the game. Now with no outs and a runner at first base, the second batter comes up. The team at bat turns over the next offensive card, which in this case is the Ace of Bats. The chart shows that the Ace of Bats is always a sacrifice. Here, with a runner on first, it is a sacrifice bunt. With a runner on third, it would have counted as a sacrifice fly, and a run would have scored. Had there been no runner, it would have been an infield out. 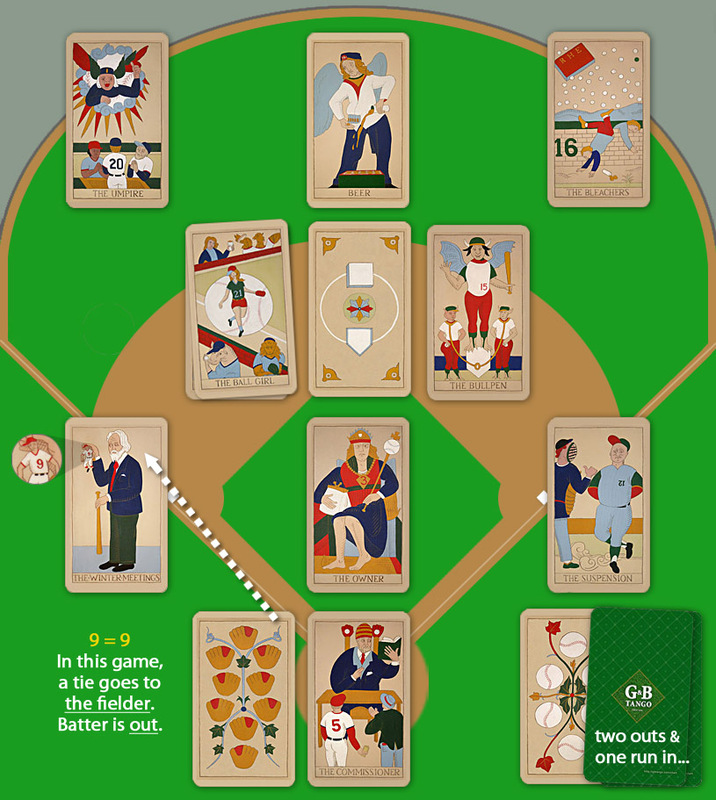 The Six of Balls is moved to second base and the Ace of Bats is retired. A card that has been retired is placed face-down near the third or first base side, whichever is closer to the player currently at bat. In this way, the number of outs in an inning can be seen at any point. Likewise, any runs that score are placed face-up near the outs stack. In this way, the number of runs that have already scored in an inning can also be seen. The Six of Balls is at second; the Ace of Bats is retired. The third card turned over in this example is the Veteran of Gloves. The chart shows that a Veteran has a value of 12 and indicates a ball hit to centerfield. The Veteran of Gloves hits a fly ball to center (he always does)... and in this case, is retired for the second out. Because of the switch made earlier by the defensive team, the centerfielder has a value of 14, and the Veteran is retired on a long fly to center. The Six of Balls remains at second, there are now two outs, and the defensive player can allow him/herself a managerial spit of satisfaction. The batting team now turns over the fourth card of the inning. It is the Deuce or Two of Bases. The Deuce of Bases always indicates a double, as can be seen on the chart. Any runners on base advance as many bases as the hitter (see Base Cards). The Deuce of Bases is always a double, regardless of the defensive cards in the field. With the two-base hit, the runner on second also takes two bases and scores. The Deuce of Bases slides into second and stands up, calmly dusting off its uniform. The Six of Balls is laid face-up near the field, to show that a run has scored this inning. The next offensive card is turned over. It is the Nine of Gloves. The chart shows that a Nine of any suit means a ball hit to third. The defensive card at third base is #9 (The Winter Meetings), put there by the switch earlier in the inning. 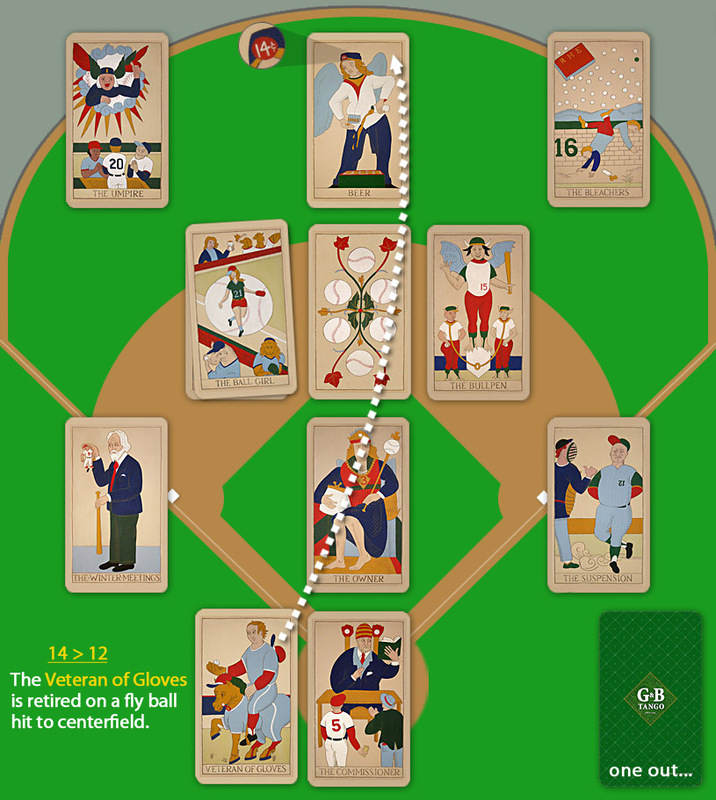 Both offensive and defensive card values are 9, and since a tie goes to the fielder in this game, the Nine of Gloves is retired, third to first. Once the side is retired, the retired team gathers all the cards left on base, the cards in the outs stack and any cards in the runs stack. These are combined with the rest of the team's offensive cards and reshuffled thoroughly. The same player then gathers all of the used and unused defensive cards from this inning, shuffles them and takes the field. The shuffling of any deck while an inning is in progress is prohibited (see below however, on Relief Pitchers and Pinch Hitters). Between-inning shuffling of both the defensive deck and the offensive deck of the team that is about to come to bat is imperative. The game then continues in this manner for nine innings, or more if the teams are tied at that point, as in major league play. When The Fan occurs in a defensive alignment, it must remain in its original position for the inning. The Fan may not be the card for which a substitution is made, nor may a switch involve The Fan. Any ball hit to The Fan results in an error of as many bases as would be awarded a base hit to the same location. If The Fan is in rightfield when an All Star comes up, the result is considered a home run rather than a four base error. If The Fan is pitching, all automatic strikeouts (the Three of Bats, The Whiff, etc.) become foul balls and are placed on the bottom of the offensive deck. The next offensive card is then turned over as the official at-bat. The defense has no recourse to a Relief Pitcher in an inning in which The Fan is pitching. When The Fan is the defensive card at the targeted base in an attempted steal, the result for nearly any determining card is an error and the runner takes an extra base (see Base Stealing [Exceptions]). When The Fan is the catcher in an attempted steal or bunt, the value of the determining card is doubled (see Base Stealing [Exceptions] and Bunting [Exceptions]). If a hit by a card of the base suit gets past the first baseman or the third baseman, the result is a double rather than a single (see chart). If the Rookie of Bases comes up while the defensive card in left has a value lower than 11, the result is a double rather than a single (see chart). If the Veteran of Bases comes up while the defensive card in center has a value lower than 12, the result is a triple rather than a double (see chart). As a runner, any base card takes an extra base on a hit; ie. a base card goes from first to third on a single, scores from first on a double or scores from second on a single. Base cards can tag up, scoring from third or taking third base from second, on any outfield flyout. Base cards are the only cards that can attempt to steal a base. These optional rules may be used by more experienced, baseball-savvy players. 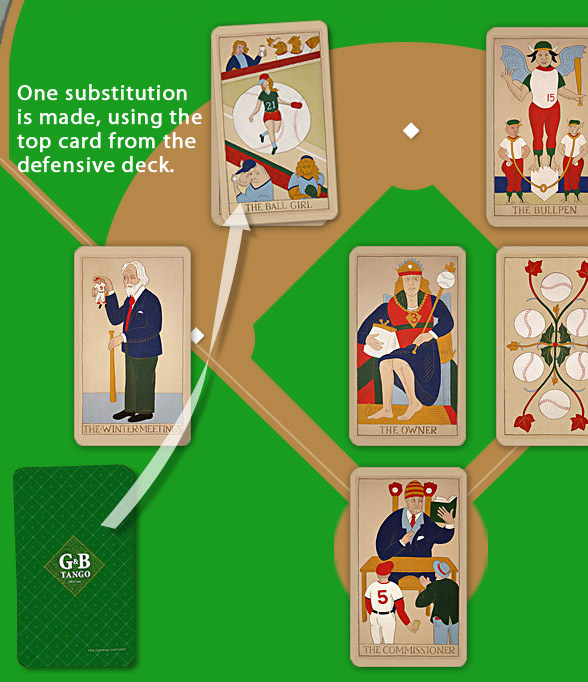 To employ a relief pitcher, the defensive team takes the top card from the unused defensive pile in the dugout, turns it up and places it over the pitcher card. In addition, the defensive team must shuffle the opposing team's offensive deck (see The Fan). A runner must reach base in an inning before a reliever can be inserted. Once it is in the game, a reliever must pitch to at least one batter before being replaced by another reliever. Bringing in a reliever is an additional option to switching and subbing. All may be done at once, if the defensive team so desires. Each team is allowed 2 relief pitchers per game. In employing a pinch hitter, the offensive team is allowed to shuffle his/her offensive deck at any point in an inning. Each team is allowed 2 pinch hitters per game. Big deal. To employ a pinch runner, the offensive team first declares which runner will be replaced, then turns over the top card of his/her offensive deck atop the declared card. This is done to try to get a base card on base. Of the four special cards (The Whiff, The Circus Catch, The Beanball and The Pickoff), only The Pickoff functions as a base card. Each team is allowed 1 pinch runner per game. Only a card of the base suit may attempt a steal. If a base card is on any base and the base in front of it is unoccupied, the offensive team may elect to attempt a steal. This is done by declaring the attempted steal before turning over the next offensive card. After the steal is declared, the offensive team turns over the top card of his/her deck and lays it down next to the catcher, just as is done for a normal at-bat. If this card, called the determining card, is greater than the defensive card at the targeted base (2nd base, 3rd base or home), then the result is a successful steal. If the defensive card is higher than the determining card, or if their values are equal, the runner is thrown out. Each team is allowed to attempt a steal whenever it is possible. Ace of Bats - ball is bunted; runner advances to targeted base and batter is thrown out at first. Ace of Balls,- runner is thrown out; batter is struck out (double play). Ace of Gloves -runner is thrown out; batter is struck out (double play). Ace of Bases - successful steal; no throw. The Beanball - wild pitch; runner takes an extra base. The Pickoff - runner picked off, tagged out. The Whiff - Successful steal; batter strikes out. The Circus Catch - runner is thrown out. These eight exceptions overrule the effect of The Fan as the defensive card involved in a steal. So the offensive team should not get absolutely cocky about attempting a steal when The Fan is the defensive card at the targeted base ~ four of these cards would produce clearly negative results for the team attempting a steal, even against The Fan. If there is at least one runner of any suit on base, the offensive team may elect to attempt to advance the runner(s) by having the present batter bunt. This is accomplished by declaring a bunt before revealing the next offensive card. After the bunt is declared, the offensive player turns over the top card of his/her deck, just as is done for a normal at-bat. If this card, called the determining card, is of a higher value than the value of the defensive card at the catcher's position, all runners advance and the batter is retired on a sacrifice. If the determining card is equal to or lower than the catcher, then the lead runner is thrown out, any other runners advance and the batter reaches first base (See The Fan [as catcher]). If the determining card in a bunt is higher than the card at the catcher's position and the determining card is a picture card (any Rookie, Veteran or All Star), the result is a bunt base hit. Each runner advances one base and the batter moves to first. Each team is allowed to bunt whenever there is a runner on base. Ace of Bats - sacrifice; any runners advance and batter is thrown out at first. Ace of Balls - batter struck out; runners do not advance. Ace of Gloves - lead runner and batter both thrown out (double play). 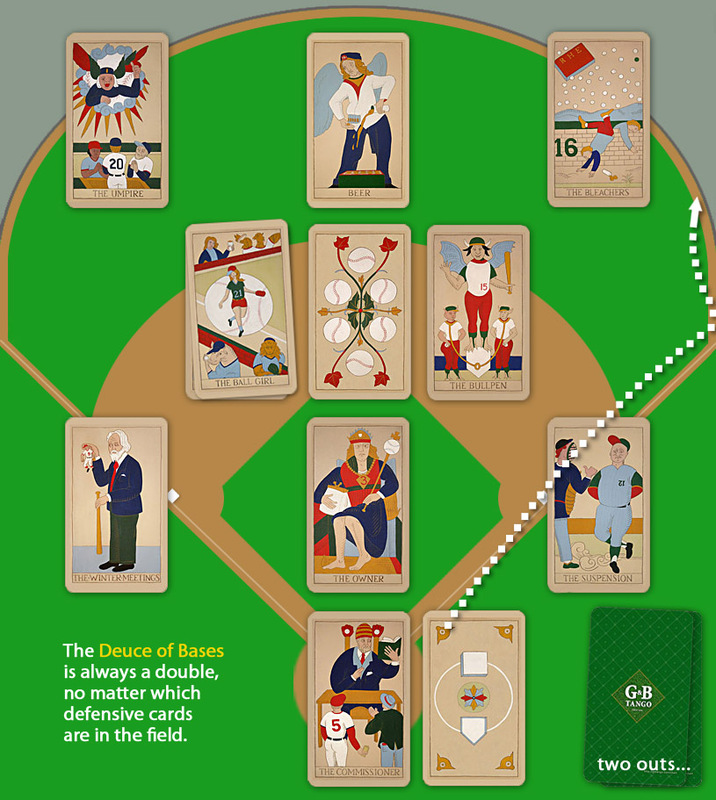 Ace of Bases - sacrifice; any runners advance and batter is thrown out at first. The Beanball - wild pitch; runners advance; batter has option to continue bunting or swing away. The Pickoff - lead runner picked off; batter may still bunt if there is another runner on, but must swing away if not. The Whiff - batter struck out; lead runner thrown out (double play). The Circus Catch - lead runner is thrown out; batter reaches first. These eight exceptions overrule the effect of The Fan as the defensive card involved in an attempted bunt. Double play cards (the Ace and Deuce of Gloves), if two are out or the bases are empty when they are drawn, count as a single out. On infield chances which result in outs, a fielder's choice situation exists. If a force is possible, the defensive team may choose to retire the lead runner or to retire the batter on a line out or pop out. But hey, let's play head's up ball out there! If the Pickoff card is drawn when there is more than one baserunner, the defensive team decides which runner has been picked off. The lead runner, one would think. As indicated on the chart, if there are no runners on base when the Pickoff is drawn, the result is a foul out, and the current batter is retired. Any drawn offensive card which does not result in an at-bat (such as the determining card in a steal, a wild pitch, a foul ball, etc.) is placed on the bottom of the offensive deck. If The Whiff comes up three (3) times in the course of a game, then the game is rained out upon the third appearance. If more than 4½ innings have been played by this time, then the game is official and ends with the present score. If The Beanball comes up three (3) times in the course of a game, then a brawl breaks out upon the third appearance. 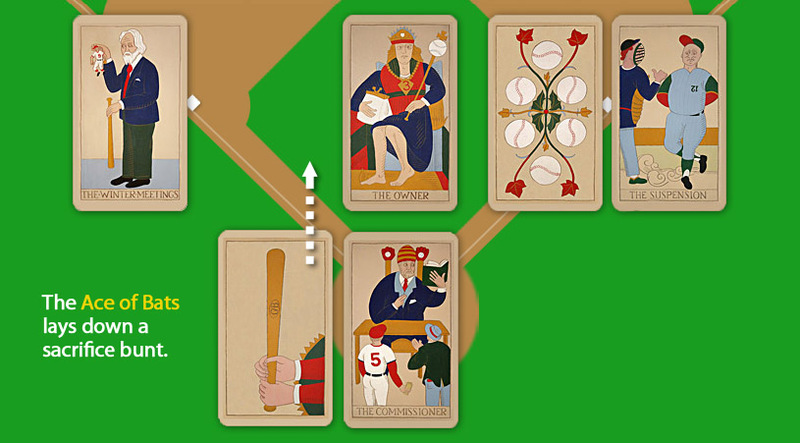 The top nine cards are taken from each team's offensive deck and are ejected from the game. 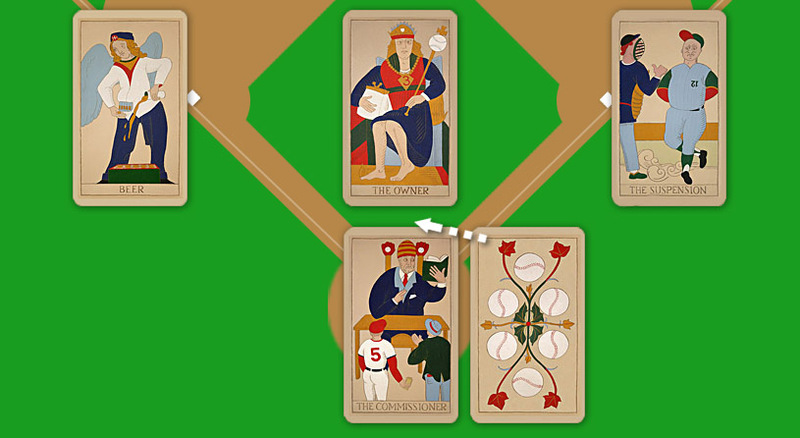 The Tarot de Cooperstown as described produces results which closely parallel those of modern baseball. Tight games as well as real blowouts occur with regularity. The average number of runs per team per game is about 5. The average number of hits per team per game is about 11. Errors usually occur about once per team per game. By experimenting with the size of the offensive lineups (for instance, dealing out 20 cards rather than 28 cards to each player), different distributions of hits and runs can be achieved. For those who have a soft spot for tight, high-scoring slugfests, with scores resembling soft-ball, all 56 offensive cards may be shared by both players. True addicts will happily wish to view their offensive decks after a game in order to appreciate the relative strengths and weaknesses that were dealt. In this method, the first known use of which occurred in 15th century Flanders, the cards may be minutely examined and a judgment of the lineup may be rendered by various sportswriters. If both players agree, another game may ensue, and it will come to pass as the great Ernie Banks envisioned -- a great day for a doubleheader!